Yes it's that popular tv show - but the test seems much better than simply shooting an arrow into a few planks and declaring victory for the archer. Good wood, shaping, and a decent hide cover seem to make a considerable difference. And note that the wood here is thin. Very interesting footage of how the different shields absorbs the energy (or not). It seems to be a domed Carolingian shield type, they are reproducing. With this shield you are "shield-passive" and use it as mobile armour, whereas a viking shield is an offensive weapon used to make shield-binds. It seems reasonable that two different kind of viking shields would have been in use. 1) A thin uncovered shield for duals, where the splitting effect of blows actually can work as a sword catcher. 2) A thicker rawhide-covered shield for battlefield combat. [but viking shield are still fairly thin, so you can move them fast as they are not mobile armour to the same degree as the Carolingian shield]. We have no idea how Carolingian shields were made. We don't know the materials used, their size, or their thicknes. AFAIK all we have are some crude illustrations. There isn't enough info to attempt a reconstruction. Round bossheld and medium sized? I don't know much about it either but I recall fellow forumite Matt Easton being relatively similar to contemporary Angelo Saxon ones. That's all I can say I am afraid. I wouldn't say the illustrations are that crude. If anything those pen drawings are more realistic than later manuscripts. Now I do not know if those Frankish Manuscripts depict franks but if they do we could make some educated guesses. Varrying size, dome shaped and multiple boss styles. How do you know that they were domed shaped and were not simply an attempt at 3d perspective? How does an illustration tell you whether an item is made of leather or painted wood? They appear domed from every angle in those drawings and the domed surface could be something they inherited from Roman shield design. Not enough to win a case I know, but it's a reasonable suspicion is it not? 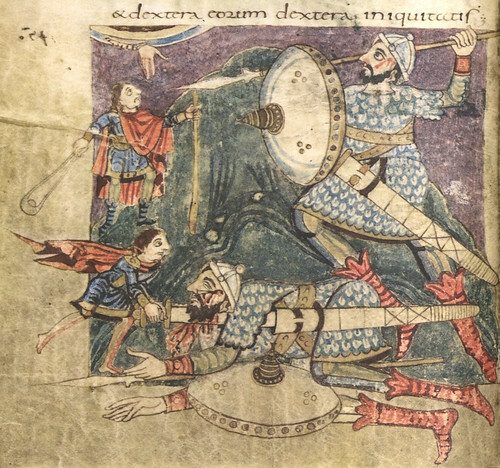 Now I know the Anglo-Saxons and vikings could have had vastly different shields but maybe their shield finds and these crude drawings combined can lead us to the reasonable assumption that their shields were circular (and not square) in shape with wood being a likely candidate for the main material used in its construction. I hope someone finds the drawings interesting enough. Not really. This is bias formed from a preconception that they had domed shields. Did I state that I believed them to be domed somewhere in this thread? That could be the case but I had forgotten about it. I suppose we need a neutral viewer then. You did say that they appeared domed from every angle. As a neutral viewer, I would have to say that to me they looked domed, so if I had to pick dome vs. flat I would vote for domed. But I don't think they look so domed that one can say for certain that they are. The one the angel is holding in the little pic on the left looks flat, so I'm not sure if the others are supposed to be domed or are just a screwed up perspective attempt at showing guys with flat round shields. I like the angel pic because it shows us the back of the shield. There is another one showing the back of the shield and two spears being held in the same hand. It isn't possible to hold spears like this behind a domed shield - the shield has to be flat. 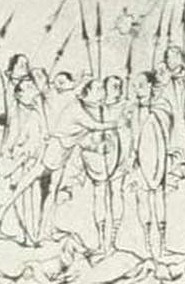 Two more images showing spears being carried behind the shield. 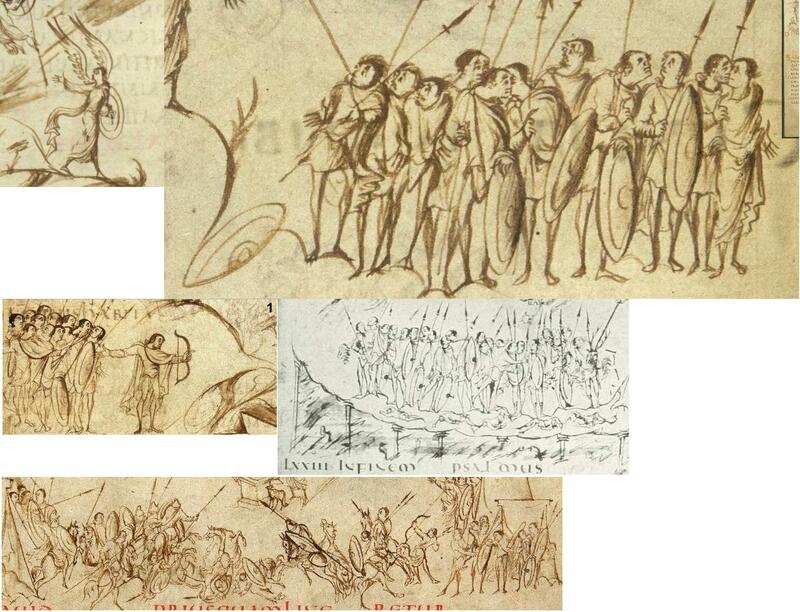 The spears do indeed seem a bit thing but the clothing, spearhead and horses (especially the horses) seem more realistic than say the Bayeux Tapestry or the Mac' Bible. The two spears (Perhaps javelins) is a valid point. A likely explanation could indeed be that they are flat. Another possible explanation is that those shields aren't boss held, in this regard the angle depiction is a bit ambiguous. 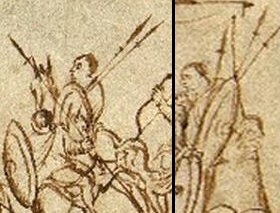 A shield strap seems even more likely when keeping in mind that the shields are shown being used on horseback. In this thread http://www.myArmoury.com/talk/viewtopic.php?t...w=previous the shield strap is actually shown. Could it be possible both types were used? The regularity with which the artists from various parts of Europe depict the boss off center in those other Psalters and the bulbous shape really seems to point that way. Forgive me if this has been mentioned before (I didn't read all 11 pages of the thread), but I believe a lot of Norse era shields were made of linden wood, which though light, is very fibrous and tough. IIRC, some tests showed that this type of wood was much better at stopping arrowheads than other, harder woods which would just split a little on impact and let the arrow through more easily.